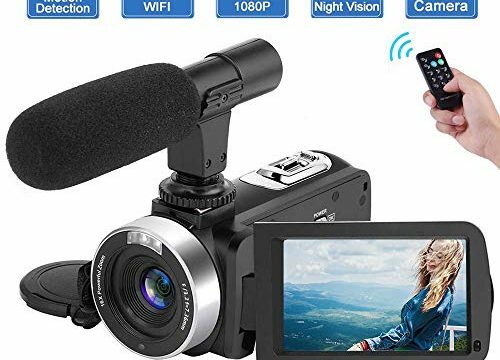 Camcorder with External Microphone: This video camera not only has built-in microphone but also comes with a high sensitive external shotgun MIC. It is very useful in recording to reduce noise and provide much better video sound. Please note the plastic packaging of MIC battery should be removed when you are recording with MIC. Full HD Camcorder: This camera is 1080p 30FPS 24.0 MP digital camera with 270 degree rotation 3-Inch TFT screen. You can rotate the screen to take a selfie. This vlogging camera with remote control can work as webcam. It is great for Youtube and you can share your life anytime and anywhere. Youtube Camera with WiFi Function: Wi-Fi function supports data transfer via the “action camera” app. You can browse your photo in this app. Meanwhile, you can upload videos and pictures to tablet PC, smart phone and laptop. This camera can help you share your photos or videos anywhere, and in anyplace. IR Night Vision Camcorder with 3.0” Touch Screen Function: With the night vision function, you can record at night or when the light is weak. The IR lights deliver a brilliantly clear, bright picture (black and white) in the darkest of scenes. With 3.0” touch screen function, you can easily pause and start your recording on the screen. Warranty: A one-year warranty for the video camera is provided by Gongpon. Any doubts or displeasure in our products, please feel free to email our customer service team by Amazon. We will reply you within 24 hours and give you a satisfied solution.